The Patagonia Fitz Roy Down Parka is an exhibition-weight insulating jacket that provides the ultimate protection against harsh weather conditions.The Patagonia Fitz Roy Down Parka is made from top quality, wind resistant, lightweight Pertex Quantum with DWR to keep out any snow or rain, while inside it’s stuffed with 800-fill-power 100% traceable down to keep you warm. The high sheen fabric in the arms and shoulders increases the effect of the DWR for even better water-resistance. Elsewhere, the long fit adds extra warmth, while extra insulation in the back of the neck helps keep out draughts, as do the insulated tubes on either side of the zip. The single-pull adjustable hood is helmet compatible, while the large internal pocket is perfect for warming up freezing gloves or storing snacks – the ideal cold weather insulator. Screaming winds? Below zero temperatures? Well in this jacket, you wouldn’t even know it. MATERIALS Main shell and lining: 1.1-oz 20-denier 100% nylon Pertex Quantum® fabric with a DWR (durable water repellent) finish. REINFORCEMENT SHELL: 1.1-oz 20-denier 100% nylon Pertex Quantum® Y yarn with a DWR (durable water repellent) finish. INSULATION: 800-fill-power 100% Traceable Down. Patagonia is the only company in the world to implement a 100% traceable down program, which ensures that no birds have been force fed, live plucked or generally treated badly. As the bird farming industry is large and difficult to track, this project has been seven years in the making, and was finally brought into production in 2014. 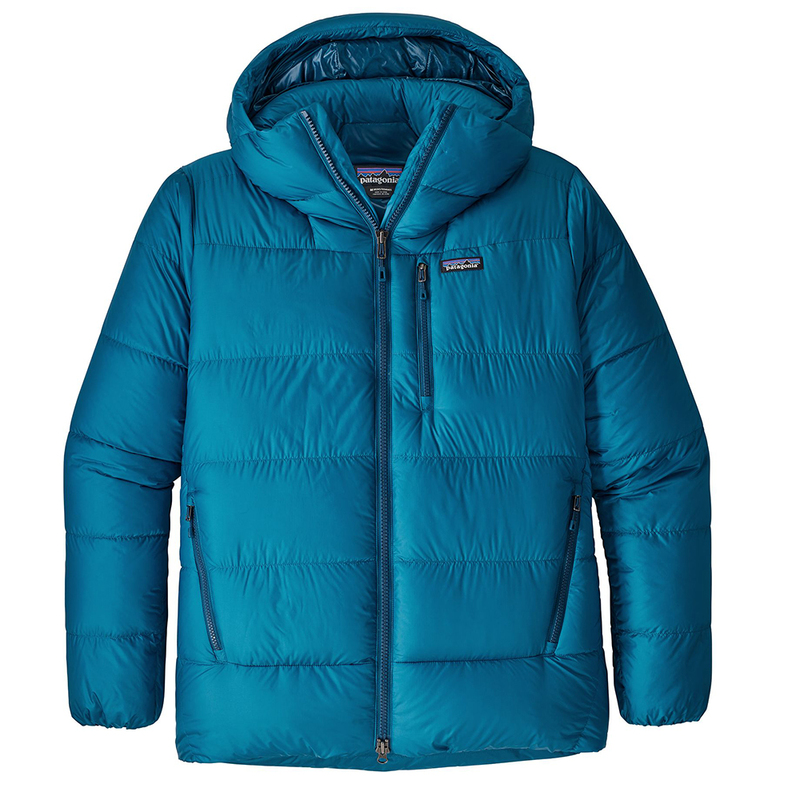 In 2015 Patagonia’s methods and standards were adopted to form a global standard of down production. The Patagonia Fitz Roy Down Parka comes with a separate stuff sack that you can pack the jacket up and stash it in. This makes for easy packing and keeps the jacket nice and compact when it’s in your backpack.